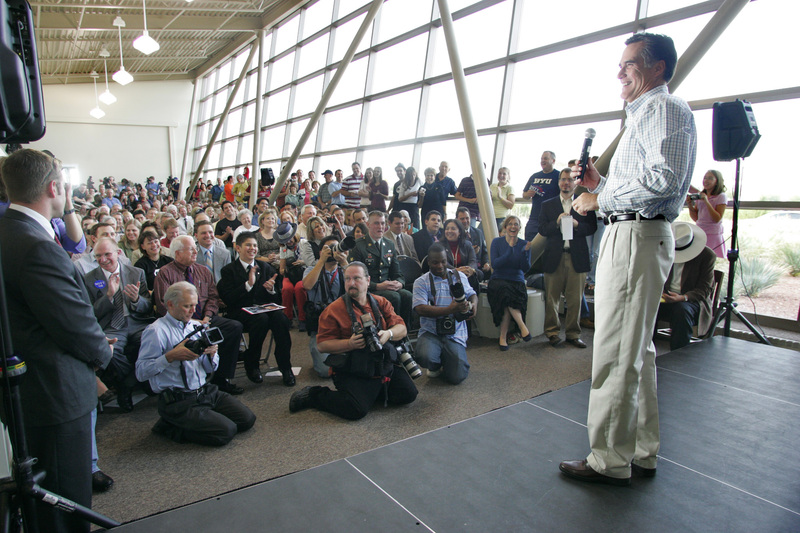 Presidential hopeful and former governor of Massachusetts Mitt Romney speaks to a couple hundred supporters at the Paseo Verde Library on Nov. 17, 2007. Romney's Credentials: With telegenic good looks, a familiar old guard Republican name and a refined conservative message, Mitt Romney, former governor of Massachusetts, is hoping to attract Republicans looking for an alternative to Rudy Giuliani. Romney quipped he represents "the Republican wing of the Republican Party," in October in Sparks, Nev. Romney said he was the candidate who can win over economic conservatives, social conservatives and foreign-policy conservatives. However, Romney has some hurdles to overcome. One, he's been criticized about having said in 1994 he wasn't a Reagan man. Two, evangelical Christians conservatives might not like the fact that he's a Mormon — which some see as a heretical form of Christianity. He is a former bishop and stake president of The Church of Jesus Christ of Latter-day Saints. There's also Romney's stand on social issues, which were more moderate when he was governor. Although personally opposed to abortion, Romney at the time had been in the pro-choice camp, explaining that was because his sister-in-law had died from illegal abortion. However, Romney has since changed his stance to pro-life, prompting some, such as former GOP presidential rival Sam Brownback, to complain he's late to endorse one of the party's main planks. Romney has also refined his position concerning gay marriage. Although he favored civil unions as governor of Massachusetts as a compromise to gay marriage, he has backed off on his support and more recently supported a constitutional amendment that would define marriage as a union between one man and one woman. During an October debate, Romney had some trouble going toe-to-toe with his opponents. For example, he stumbled on a question about going to war with Iran, saying he would need to consult with lawyers before making a decision, a remark that was criticized by his rivals and by pundits. Romney is the son of the late George Romney, a 1968 GOP presidential candidate and former governor of Michigan. His mother, Lenore Romney, ran for U.S. Senate in 1970 in Massachusetts. Romney is a former chief executive officer of the management consulting firm Bain & Co., and built his own private equity investment firm, Bain Capital. When the organizing committee for 2002 Winter Olympics in Salt Lake City was having trouble hitting fundraising benchmarks, Romney was hired in 1999 to head it and turned it around, ending up with $100 million surplus. He first ran for office in 1994, trying to unseat Kennedy from his long-held seat in Massachusetts. Republicans talked him into running for governor in 2002 and he served for one four-year term. Romney announced his presidential candidacy Feb. 13, 2007, in Michigan. Experience: In 1994, Romney ran for the U.S. Senate seat in Massachusetts on the Republican ticket, but lost to incumbent Ted Kennedy. In 2002, Romney ran for governor of Massachusetts and won. He served one term as Massachusetts governor from 2003-2007; he did not seek re-election for a second term. Notable: His wife Ann and him are high school sweethearts. Romney on the Issues: A look at where Romney stands on the issues and how he has voted. Nevada Contributions: A breakdown of Romney's financial contributions from the Silver State. State by State Contributions: A breakdown of Romney's financial contributions across the U.S.
YouTube Videos: See Romney's latest political videos. Romney's Blog: View Romney's official campaign blog.